Love matters to God: a lot. How much does it matter to Him? Well, just read the above passage. Jesus taught us that the greatest commandment is to Love God with everything we have. And the second greatest commandment is like it: we are to love our neighbor like we love ourselves. Today begins a devotional series on some of the things God’s word has to say about the topic of love. The Bible has many, many things to say about love; there are so many that if we discussed them all this would become simply the Daily Love Devotional. So, we are just going to look at some of them. The key take away for today is going to be to take note of the fact that Jesus didn’t say these two were the biggest suggestions; He said they are the biggest commandments! These aren’t things Jesus would have us do if we don’t mind, or if we agree or if we like it. We are to love our neighbor just as we love ourselves, which for most of us is fairly completely. God says so. If we choose to NOT love our neighbor, we are basically thumbing our noses in the fact of Almighty God! That is really not a good idea. In the previous section we discussed the same passage as we will briefly discuss here. Our focus will be on the last sentence of the passage. What does it mean that all the law and the prophets hang on those two greatest commandments? It’s a pretty visual and simple illustration Jesus used, really. Just picture a rack entitled, “love.” On the rack there are two pegs, “The Law” and “The Prophets.” Now picture what happens if there is not a rack entitled “love.” Got that? The pegs fall to the ground if they are not attached to a rack. Jesus was just illustrating that all of God’s expectations concerning His moral law can be met if we just do two things: Love God and love each other. So when they had dined, Jesus saith to Simon Peter, Simon, son of Jonas, lovest thou me more than these? He saith unto him, Yea, Lord; thou knowest that I love thee. He saith unto him, Feed my lambs. He saith to him again the second time, Simon, son of Jonas, lovest thou me? He saith unto him, Yea, Lord; thou knowest that I love thee. He saith unto him, Feed my sheep. He saith unto him the third time, Simon, son of Jonas, lovest thou me? Peter was grieved because he said unto him the third time, Lovest thou me? And he said unto him, Lord, thou knowest all things; thou knowest that I love thee. Jesus saith unto him, Feed my sheep. First of all, this devotional is not going to be a deep theological dissertation on all the various meanings in the passage above. Someday perhaps we will do that, but not today. I am only using it to illustrate what love means. Peter, do you agape me? Yes Lord, you know I phileo you. Peter, do you agape me? Yes, Lord, I phileo you. Peter, do you phileo me? Peter, mildly put out, replies, Lord you know I phileo you. As I said, here we are not going to analyze that passage; it just works well for what we are going to do briefly, which is explain just what love is. Agape love is the kind of unconditional, sacrificial love which God The Father has for us. It is not based on feelings or based on if the recipient deserves it or not. It is the kind of love that is willing act and sacrifice even when another is totally undeserving. It is the kind of love both God The Father and Jesus Christ displayed when God sacrificed His Son for us, even though we did not deserve it. 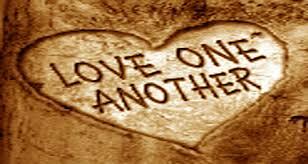 Agape love is the kind of love we are commanded to practice towards our fellow humans. Phileo love is the kind of love we might have for a friend, or brother or anyone who we are fond of. This love is feeling based; in other words, this is based on whether we actually like a person or not. It might be sacrificial in some circumstances, but only insofar as it meets the needs of the person sacrificing. Jesus commanded us to love our neighbor as ourselves. The kind of love He commanded was not phileo love, but agape love. Because we are not to commanded to love just those we actually feel something positive for; we are commanded to love our neighbor. Who is our neighbor? Keep reading! Who Is My Neighbor Anyway? This passage in Luke is similar to the story we saw in Matthew 22:34-40 Again, a lawyer was trying to trick Jesus by asking Him what is the greatest of all the commandments; again, Jesus answered him by saying that the two greatest commandments are to love God with all you have and then to love one’s neighbor as oneself. The lawyer, probably knowing he had failed on this count, attempted to excuse himself by asking, “And who is my neighbor:” Jesus then explained what He was trying to say by relating the well known story of the Good Samaritan, which readers can read here. Most of us know the ending of this story; Jesus asked the lawyer, based on the story, just who had been a true neighbor to the man in need. The answer of course, was that the Samaritan who rendered aid to the wounded man was his neighbor. The lesson in love shown here by the Samaritan who helped the hurt man is actually quite simple. It is really an illustration of how Jesus loves all people and how we, in turn are to love all people. Our neighbor may be someone who is totally different from us and many even be an enemy. Any reading of the Gospels reveals quickly how Jews and Samaritans felt about each other. In this case the needy man’s own people, the priest and the Levite passed by him while the enemy, the Samaritan, stopped to help. Our neighbor may be someone we have no obligation to help. Certainly the priest and the Levite were duty bound to help their fellow Jew, but they did not. The Samaritan, with no ethnic or religious duty whatsoever, stopped to help. Our neighbor may be someone who poses potential risk or sacrifice to us if we help. There were many good reasons not to stop and help a person on the road to Jericho; it was a dangerous place filled with robbers. The hurt man may have only been a trap, for instance. Our neighbor may be someone who doesn’t deserve our help and certainly cannot be expected to repay us. Not only did Jews hate Samaritans, but they would have treated them as second class citizens, no better than dogs. One of the reasons the priest and Levite would not have stopped is that even touching such a person would have made them ceremonially unclean. Stopping to help a man who probably thinks you are worse than a dog is a hard thing to do. The Samaritan certainly did not know if he would ever see the money he spent returned. In fact, he dropped the man off at an Inn and left extra money in case his bill ran over. He even said he would come back by and make good on any more expense that may have arisen. So then, who is our neighbor? Short answer: everyone. There is nothing that someone we may have contact with can do to make them undeserving of being our neighbor. All people, of all types, all races, all religions and all personalities are our neighbors. Jesus has commanded that we love those people as we love ourselves. We are to deal kindly in our encounters with all of our neighbors, as the Samaritan did with the wounded Jew. We are to show the kind of love Jesus showed for all humanity on the cross. He died not just for the lovable, but for all. We have already covered previously where Jesus informed the lawyer trying to trick Him what the two greatest commandments are: Love God with everything you have, and love your neighbor as you love yourself. That was not the only instance where Jesus made it crystal clear that to love our fellow man is not something He would really, really like us to do, but is a commandment. Jesus feels strongly about the things He has commanded us to do. In John 14:15 Jesus said, “If you love me, keep my commandments.” If we love Jesus, if we are one of His, we will strive to do as he says; in our devotional verse we learn that He commands us to love one another. Isn’t that fairly simple? If we love Jesus, we will love one another. “The world” is from an obscure Greek word which means “everybody in the world.” Okay, it’s not really obscure; it simply means what it says. The point is, we are to love the world as well. Before anyone gets excited and starts telling me that The Bible says not to love the world, let me define. Loving the world means loving the people of the world, not the things of the world. Just in case the point was not clear, let’s recap what Jesus had to say about His commandment to love. 1 John 4:21And this commandment have we from him, That he who loveth God love his brother also. Got all that? Seems pretty clear. In later devotionals we will discuss just what it means to love our fellow man, and some ways in which we can do it. Posted today on Church Set Free. Head on over and share your thoughts. Seems pretty clear to me, too Wally.